We were recently given the opportunity to review a couple of Individual Units from Moving Beyond The Page. We chose the Language Arts Package - A Wrinkle In Time/online version and Science Package - Space to supplement what we had already been learning the past school year. First up, let me tell you a little about Moving Beyond The Page, whom I had never even heard of! A few of the co-founders of this curriculum are in my neck of the woods even (eastern NC). I'm still amazed at all the curriculum choices available to homeschoolers these days. Moving Beyond The Page is available as a complete comprehensive homeschool curriculum or as a supplement allowing you to put together your own curriculum. Subject areas covered are Math (for age levels 5-7 and 6-8 only), Language Arts, Writing, Science, and Social Studies. The units can be purchased in physical copies as well as online copies. The age ranges are from 4-14. Moving Beyond The Page is also a literature based curriculum that was designed with the gifted learner in mind. The student studies concepts or big ideas that connect each subject together and help apply them to their lives and world. Please do not click away yet if you don't feel your child is gifted. The curriculum takes great care to break subjects down by age levels rather than grade levels and guides you to pick the best level for your child which I find more and more valuable in homeschool situations! More can be read about picking the right level here and they also offer placement tests. Since we had the chance to review one of the online individual units and one of the physical individual units, we were able to get a good feel for both. I love that they offer both options for families and they also let you choose whether or not you want to purchase the literature books or get them from the library. We chose Concept 4:Systems from the 9-11 age level so we used Unit 1: Space and Unit 1: A Wrinkle In Time/online version together to see how the studies related to each other. Here you can see the other units available in the Concept 4 category. 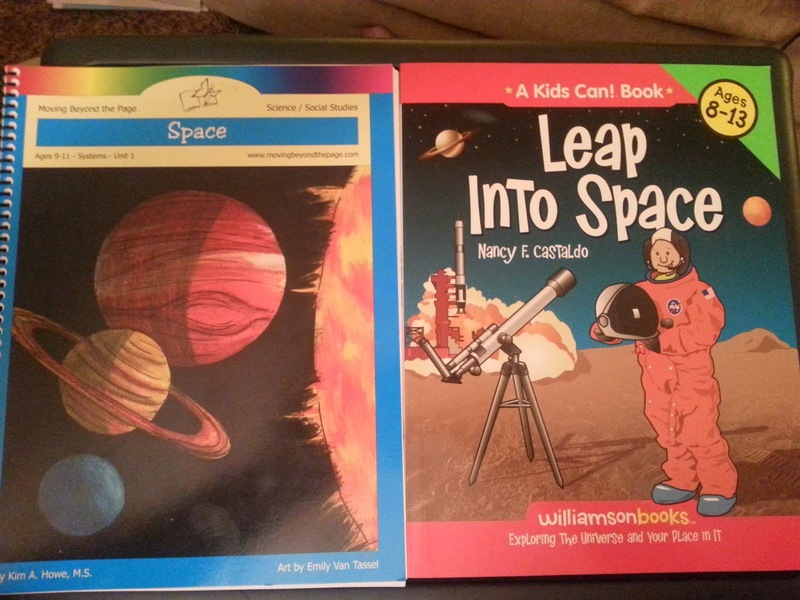 In the Space unit, you are sent the 2 books pictured below. They can be purchased online for $29.98 plus s/h. The online version is $25.92. The Space book has your lesson plans which are written to the student and include check boxes for them to mark when they have completed a task. It also contains parent overview pages in the back giving you the big ideas your child should have learned, skills, vocabulary definitions, answers to questions, and much more for the teacher. That portion would need to be taken out if you gave your child the book to work with or at least that's what I did. This unit can be completed by your student in 2-3 weeks and teaches about the sun, moon, planets, and science exploration. There are 5 lessons in this unit and a final project due at the end where your child will get to put all he/she has learned into practice in a fun way of being a space tour guide. The parent overview section helps you walk your child through each lesson including the final project. Most lessons can be completed in 2 to 3 days. Of course, you can slow that pace down if you need to and since it is summer we did. Instead of finishing in 3 weeks, we finished in 4. Included in each lesson are lots of activities such as small projects, filling in worksheets, simple experiments, or making booklets that are included in the lesson. You do not have to do all the activities but they are highly suggested since they are the heart of the lessons. Often times, you will be given a couple of activity options allowing you to pick which level is best for your child. I used this with Sarah, who is 10 and right in the middle of the age level range. She needed a little help occasionally but this was a great beginning to leading her down the road of independence. 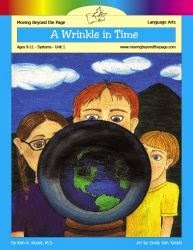 We also used the Literature Unit- A Wrinkle In Time that was designed to go along with the space unit. The physical copies can be purchased online for $23.98 plus s/h. This price does include the literature book. The online version is $19.92 and also includes the literature book so you would have to pay shipping costs on the book. Again, you have the option to pick up the literature book at the library to save a little money if you wish. I could definitely see why they would pair these 2 units together. We had never read A Wrinkle In Time before so it was fun to add it to our reading list. This time we were given the online version so we only received the physical literature book and the rest of the lesson plan was online. The online version is the same thing you would receive in the physical version. You still get the parent overview and your children can choose to type their answers to the questions on the computer or print out a sheet to write them on. I choose to print everything out because that just made it easier for Sarah to use on her own. They are hoping to add more clickable links to the online version in the future which will also be included in the physical books. This might be another factor to consider when deciding between the online or physical versions. My personal option would still be the physical versions but I also still find it hard to read a kindle book versus a hard copy book. Let your child attempt to spell each of the ten words. If your child can spell a word correctly, he does not have to use the word as a spelling word. He can write the other words 5 times each. Use each word in a sentence. Take a pre-test. Any words that are missed should be written three times. Take Spelling test. Any words that are missed should be tested for again the following week. This unit contains 10 Lessons with a final project of writing a short story in the end. We again probably progressed through these lessons slower but most lessons required reading 1 chapter at a time and that was a little too much for Sarah to read at one time. So, we spread the lessons out to match her reading skills. Again, you can see how much flexibility this course allows you. I found this to be a very thorough Language Arts unit including learning literary terms, rubrics for writing, and grammar skills. It's hard to find all of those in one program but I think Moving Beyond The Page has done a fantastic job with this! Teaching writing has never been my strong attribute so the the step by step guidance and final project in the end were really self rewarding for my reluctant writer and her reluctant teacher. You can check out more at Moving Beyond The Page or find them on Facebook. Overall, I am so glad for the opportunity to find these great products. The individual units and flexibility to pick and choose really make them affordable!